Free and Open Source Software wouldn’t be possible without Free and Open Source Licenses. These licenses give us developers and users permission to do with the software what the license states. So these are very important because they essentially are a contract between the different parties with access to the software. Let me put it that way: Your project has dependencies. Those dependencies have licenses. Your project’s dependencies have dependencies, and these have licenses too. So instead of just showing the licenses for your dependencies, we actually are able to display all licenses of all transitive dependencies. Go into your project’s details view. Next to the Dependencies tab you see the Licenses tab. When you click the button, VersionEye will fetch all transitive dependencies and their licenses. This will give you a complete overview about ALL licenses which might effect your project. We know this is a lot of scrolling, but some of our customers might need to print on paper. At the bottom of the page we display all dependencies with unknown licenses. 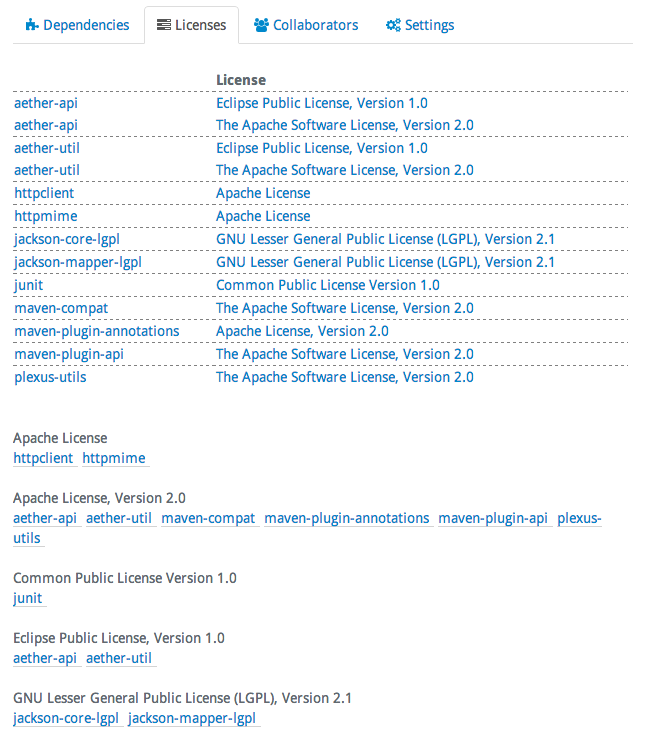 These are dependencies we can’t provide license info for yet. For due diligence you have to double check the licenses manually.